Don't forget the dedicated crunchers who are part of a team with ongoing potm's. I am constantly on those except for the occasions when projects are selected that I have no interest in & then choose a project to crunch for that month. In the case for May, I have switched over to seti. Also, I have had no choice but to permanently shutdown 8 rigs & shutdown remaining net during the night due to a shocking power bill for the last quarter (Â£1310) which is way beyond my budget. Please keep your posting style as there are those who enjoy both the on topic & off topic news. PS: - Any chance of persuading Eric/Angela for some raccon updates? I have never understood why the credit system has to be complicated. 1 credit for N number of flops. Why does it have to be any other way?? THIS SHOULD BE THE "LAW" to particapate in BOINC as a project.. PERIOD! I can understand getting.. say .5 for being the 3rd to return results but that doesn't seem fair. If you crunched it and it validates, you deserve full credit too for using the power on it. If you return garbage, you get nothing. Im not sure there is much that can be done about that. Its just the way the numbers work across time. 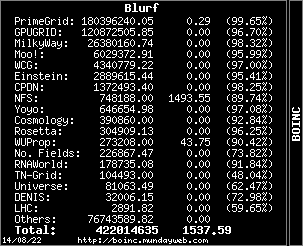 There needs to be a 'BOINC' summet and get this credit thing set to a standard system. It is NOT right that every project can have its own credit scoring system. BTW... I am NOT crunching anything but SETI as it is my sole interest. I will be adding some projects to one of my systems soon to test the software im working on but that is the only reason why. If you want credits to stay steady and at the level they were a few months ago, then start protesting against the CUDA app, and its incorrect claims and processing times. Somehow don't think you will get a lot of support, or win any popularity contests, but you never know. Message 887709 - Posted: 23 Apr 2009, 20:30:06 UTC - in response to Message 887620. Yeah, credit-per-flop on SETI is the gold standard, and SETI@home is nice and stable on that one. My compliments to the admins who have kept it standardized. Other projects have sold their soul with shocking credit inflation, sometimes by a factor of 5! Everyone knows it, though, so nobody is impressed when you need a wheelbarrow full of those credits just to buy one loaf of bread. On the RAC side, I was assuming each project can choose their own half-life for the RAC calculation, influencing the responsiveness of the RAC. If this is not the case then I should say . . . Never mind. Does anyone know if projects can choose their own RAC half-life? Opinion stated as fact? Who, me? Message 887751 - Posted: 23 Apr 2009, 23:17:49 UTC - in response to Message 887709. IFAIK this is handled by the open source database software package supplied by Boinc developers. I see no reason it couldn't be hacked like any other part of the Boinc software. It just isn't worth the time to change the standard used by everyone else. 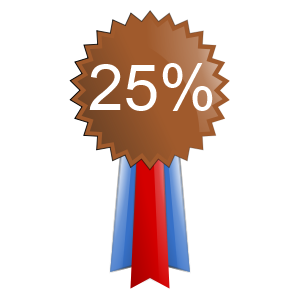 Several project over pay credits, generally they are still in the Alpha stage of development. I've found that over time as the projects mature and stabilize they tend to take a second look at the credit issue and slowly attempt to bring them back in line with the SETI gold standard. I think the main projects try to be within 10-15% of this gold standard. One as to remember that SETI also went through growing pains stabilizing its credits and still has issues with Astropulse. I know that some project do have problems doing this because the nature of the WU makes it difficult to forecast how much work is required on a new a batch of WU. Others with less sense of community either don't give a damn or may purposely pay more to attract crunchers. Boinc can't dictate to these projects, they can only suggest they come in line. Responsible crunchers on these projects are the only one that could try to persuade them to realign to be better citizen of the Boinc community. Message 887839 - Posted: 24 Apr 2009, 5:50:45 UTC - in response to Message 887709. * 1,000 double-precision MIPS based on the Whetstone benchmark. * 1,000 VAX MIPS based on the Dhrystone benchmark. Flop-based credit is just a more repeatable form of benchmark * time, and it should give the same result. Message 887840 - Posted: 24 Apr 2009, 5:54:21 UTC - in response to Message 887482. ... I'm not saying we should give more credits for work completed. I am suggesting a much shorter time for RAC gratification. Shorter recovery times for RAC would greatly decrease user frustration after an outage. For example, maybe the RAC rampup should be no longer than the typical MTBF of the SETI@home server system. No offense taken or meant, but this is not the old credit-whore argument. Sorry, I misread your intent. The basic idea with the current system is that the moving average smooths out the variations. In an ideal world, absent changes on a system, RAC would be constant. If you want to smooth out the effects of an outage, I think you'd want to average over a longer period. But I agree with your intent. Message 888434 - Posted: 26 Apr 2009, 9:07:23 UTC - in response to Message 887347. An added benefit for the Berkeley crew: Fewer user complaints about an occasional outage. Shorter recovery times for RAC would greatly decrease user frustration after an outage. For example, maybe the RAC rampup should be no longer than the typical MTBF of the SETI@home server system. Yep, a short RAC halflife will benefit the majority of users in these twitter-age. Those looking for long term drift had always look outside official stats anyway (e.g. BS-RAC). However, make it too short and we'll get a flood of complains every wednesday after the outage. Just discovered this very interesting thread, and will try to offer my few cents worth as a professional lab rat (test engineer) for over 35 years. I think we are getting a very skewed view of the "big picture" on these forums. Maybe somebody can repeat the statistic, but I seem to recall somebody recently saying that only a few thousand of the 100,000+ SETI users take part in the forums. This means perhaps a few % of SETI crunchers are even aware of some of the forum related reasons other posters put forward for the drop in membership (alleged indifference by "Them", Matt's charming and utterly human posts, etc.). By extension, I suspect this means that a similar small percentage, maybe 10% at most, are aware of the performance issues discussed (long AP completion times, CUDA effects, etc.). My first order approximation is that there has to be something else causing the observed 30% drop in membership. Something not caused by reading the Forums, or detailed tracking of project stats - since the vast majority apparently do neither. Anything involving 100,000+ people will not be simple, so I suggest we are looking for several reasons. The economy, as others have mentioned, is probably one. The need for current gratification may be another. Long AP completion times and better credit from some of the shadier BOINC projects fall into this category. I guess (hope?) I'm not typical. I saw my RAC drop and my pending climb when I tried to start using optimized AP 5.03 and though "well, this is interesting". I stuck around, worked a bit to correct my setup, and saw things turn around. Again, I said "that's interesting" and keep observing. Last observation: someone else mentioned the "human/system interface" aspect of the grand BOINC experiment. What we have here people is a great opportunity to work on this aspect. People who don't read the forums and may not understand the subtle aspects of the number crunching appear to be leaving SETI, but not other BOINC projects. Why? How do we correct this? Is there anybody in academia who focused on this aspect of BOINC? Should we be talking to them, or will it screw things up if the lab rats suddenly become aware? Message 888594 - Posted: 26 Apr 2009, 21:57:31 UTC - in response to Message 888587. Most of what you are suggsting and asking have been proposed and attempted to be put into action as far as can be done by external groups (such as teams). The problem is more of the "ivory tower" issue where the core people that can help us dig out of this mess are too busy looking inward to bother to invest even a modicum of time looking outward. One more data point is that there is a survey on the BOINC site that has some interesting data most of which is being ignored as hard as can be ... again there is a limitation because the survey is "self-selecting" and pretty well hidden, but it is interesting. As far as the study of the project as a whole, well, what do you think I have been doing all this time ... the trouble is that the conclusions are not what people want to hear so the most common reaction is to shoot the messenger. Message 888614 - Posted: 26 Apr 2009, 23:16:51 UTC - in response to Message 888594. Paul, thanks for the response. Skype is beyond my little mind at the moment, so please try a private message. I would love to discuss the human interface issues of this topic with somebody who has really worked on it. My message was shorter than I wanted, since the BBQ was hot and the wine had to be opened. (It's all about priorities.) Another thought, as a long time human factors test guy: this decline in SETI users, in relation to many of the events others discussed in this thread, could be very valid data for somebody, somewhere. "They" may not want to correct it until this phase of some bigger project is completed. Or, it may be so far down on their to-do-list that "They" haven't even noticed it yet. Hope those last thoughts doesn't offend any of my fellow lab rats. Message 888639 - Posted: 27 Apr 2009, 0:13:05 UTC - in response to Message 888573. I just brought a new cruncher on-line, and it's working on its' first work unit. It is roughly 70 hours in, and it looks like it will finish in another 670 hours or so. ... and I don't care. It's on 24/7 for reasons not related to SETI. Message 888669 - Posted: 27 Apr 2009, 2:32:44 UTC - in response to Message 888587. I don't think we have a way to tell how many readers there are on the forums, but we've got 24914 users who have posted at least once to the forums. 12877 who have posted at least twice. And 8554 who have posted at least 3 times. I think the SETI Forums would make an amazing study for someone in Sociology or Psychology. It has been observed in the past that crunching is seasonal. School districts for example drop off when summer starts, and come back on line when everyone comes back in the fall. Power rates and the Economy certainly can affect things. Some install BOINC on company-owned computers, and then the IT staff removes it. Some may be disappointed by progress. Others complain of a "lack of science" when we're doing something that is essentially binary: ET exists, or he doesn't. I think there is a perception that the SETI servers need the same up-time as Amazon.com, but that isn't true -- but some people won't accept it. A few get angry when they make suggestions and those suggestions aren't adopted, or when they don't see improvements implemented right away. But that doesn't tell us anything about the average participant, who never posts. ... and that's most everybody. Message 888746 - Posted: 27 Apr 2009, 12:08:14 UTC - in response to Message 888669. Thanks for the numbers Ned. Us engineers thrive on that sort of stuff. Looking at the numbers you provided, I now think it is possible that discussions on these forums, and users knowledge of trends in published SETI data, could have resulted in a significant portion of the drop in users discussed above. This gives me an idea. I'm sure I can't help the SETI guys with the physics and math of what they are doing (given how hard it was for me to barely pass these subjects at an undergraduate level, nearly 40 years ago). So, what can I do, I asked myself. If these forums do have a big effect on user atittudes, lets try using this power for good, instead of bitching about how SETI admins never listen to my ideas, or how many credits I get for what. I challenge each of the 40,000 or so readers of the forums to sign up one new user. Just one each. That means reaching outside of the SETI forum community, to other forums and face-to-face, and telling people why we do SETI. We must all have reasons to do SETI, that's why we are still here. Don't post here and get all righteous about Why I'm Sticking To SETI - go tell somebody else. Spread the word, brothers and sisters! Testify! You all have some great thoughts...sorry this will be long. Personally, in my efforts for fundraising and recruiting for more hardware I've had a great deal of interaction with Matt & Eric and the crew. I've also had the pleasure of getting to know Eric's wife Angela. I feel like I've been privileged to get a taste of the behind-the-scenes action. These guys do have a life outside of Seti and deservedly so. Matt's glimpses into the hills and valleys don't bug me as long as there is an equal/greater reference to the Seti hardware/science in the same post. Keep it balanced..makes it fun. IMHO In terms of the future we need to focus on 2 major points...recruitment and fundraising. People have seen my attempts and efforts. If you haven't felt like participating, that's ok-noone will down you for not donating, least not in my threads. If you have, you have my personal appreciation. People have taken a beating in this economy and a lot have shut down their hardware for survival needs. I myself have been furloughed from work but have been able to make it up in other ways and I feel blessed. If we can bring the people, the money shall follow. I myself have talked more than a few people into joining the efforts. Simple conversations in the right places and times can do wonders. I shall keep doing my fundraising drives and I will do my best to keep them interesting and unique. I will say, that despite some differences that have occurred over the time I've been involved, I have a great deal of appreciation for the knowledge, time and effort shared by all of you. Even a simple act of translation (Kudos to Ark) helps us all to share our opinions and ideas to better the project. Message 888762 - Posted: 27 Apr 2009, 13:26:38 UTC - in response to Message 888756. Message 888769 - Posted: 27 Apr 2009, 13:48:30 UTC - in response to Message 888762. Message 889248 - Posted: 28 Apr 2009, 21:05:07 UTC - in response to Message 888762. Message 889339 - Posted: 29 Apr 2009, 3:49:38 UTC - in response to Message 889248.